The EOTech® Flip Mount provides rock solid mounting options for EOTech® 3x magnifiers. The flip mount attaches to 1913 style picatinny rails with two thumb screws for easy attachment and removal without the use of tools. 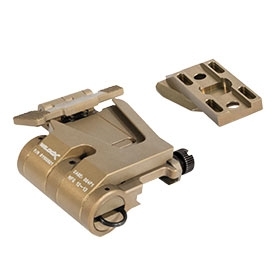 Fixed Flip Mounts feature a variety of rail options with mount permanently affixed to the rail. Allows optic to flip to a stowed position for front sight visibility or to an operational position for magnifier operation. Aluminum construction for increased durability over currently fielded products.